Printed book manuals and online access manuals are available separately. We also offer Yamaha outboard parts. New edition now available! Seloc manual 1701 (book) covers 1984-1996 Yamaha outboard 2-250HP, 1- to 4-cylinder, V4 and V6, 2- and 4-stroke models (including jet drives). New edition now available! Seloc manual 1703 (book) covers 1997-2014 Yamaha outboard 2.5-300 HP, 1- to 4-cylinder, V4 and V6, 2-stroke models (including jet drives). Seloc manuals include skill level ratings (1-4 wrenches) based upon the degree of difficulty along with special tool icons where an OEM or electronic testing tool is required to perform the specified procedure. Seloc manual 1705 (book) covers all 2.5-225 HP, 1- to 4-cylinder and V6, 4-stroke models, 1995-2004, including jet drives. 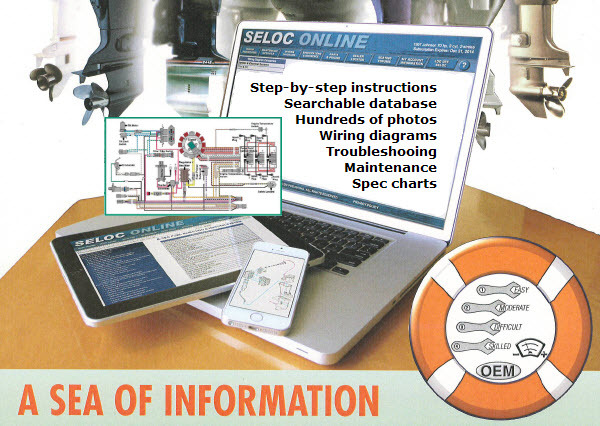 Seloc manual 1707 (book) covers 2005-2010 Yamaha 4-stroke outboard 2.5-350 HP, 1- to 4-cylinder, V6 and V8 models (including jet drives). Purchase access to the online repair and maintenance manual for your specific Yamaha model for three years. You will choose your year and model during registration and will have access to that one model for the subscription period.